1798 FREE frank entire to London showing a VERY FINE POOL, DT 366, franked "Chas Stuart" son of Humphrey Stuart owner of Brown Sea Island. 1742 FREE entire endorsed "Free Phil/Musgrave" from London addressed to Edenhall, near Penrith, Cumnberland. On the reverse is a fine London Bishop mark for 28/DE. 1799 FREE entire from Andover franked "Winchester", addressed to Aylesbury and showing a fine ♔/NO 18/99/FREE datestamp, L788. ONLY USED FOR 2 MONTHS. VERY SCARCE. 1811 FREE Entire fromn Cork to London showing a fine DUBLIN 'MERMAID' FREE DATESTAMP IN BLACK - SCARCE IN BLACK. 1820 FREE Entire from Belfast to Dervock franked by the Earl of Belfast showing a fancy circular-framed BELFAST/DATE/80 mileage. 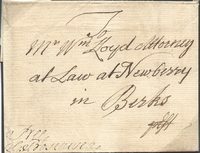 1809 DEC 25th FREE Entire from The Bishop of Norwich, franked by him in manuscript, showing a fine script-type "ABOVE PRIVILEGE", L 820b, and charged "2/8". 1800 FREE entire from Hampstead to Edinburgh franked "Loughborough" and showing a fine ♔/FREE datestamp - crown within circle, L792. SCARCE - IN USE 5 MONTHS ONLY. 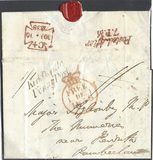 1836 FREE cover to Westminster showing a fine Cambridge/Penny-Post, CB 55. 1811 Free Entire from Cork to Brighton showing a VERY FINE DUBLIN 'MERMAID' FREE DATESTAMP - RARE SO FINE! 1805 Free cover to London showing a very fine two-line PORT/GLASGOW, 18½ x 34 mm. 1821 FREE Cover to London redirected to Ramsgate showing a very fine Boxed HOLKHAM, NK 196.